Bahamian. – Dirty wet dog , boats and sailing. One of my favourite anchoring techniques in the west-country rivers is the Bahamian moor and the reason i like it is that it allows me to lay to anchor in a tighter space with less swinging than when using a single anchor. I first started using the technique at dandy hole which as an anchorage tends to get very busy and where there are often boats that don’t anchor well. This was after a fail in the same spot using a bow and stern anchoring technique : essentially anchor-mooring the boat and what happened is that the long keeled Frances just wouldn’t lay stern-on to the current and the stern anchor just dragged with enormous pressure in the warp, there was so much force on the line that i had to buoy it and let go. This is a 2 anchor technique and seems to work best where both anchors are of similar weight and performance : i note that it worked very well when i had 2 identical bower anchors on the Frances but still worked well when i upped one of them to the next size up. My technique is this : Firstly i anchor normally by the bow and settle to the bower anchor and make sure that i am in the place that i want to be, then i allow the boat to drop back on its warp to the length of the second anchor rode minus a few metres. Often i have to let the boat settle to a new position and occasionally put the rudder over one way to shear the boat across the current slightly. I then deploy the second anchor over the stern and let out warp as i pull back up towards the primary anchor, with my warp and chain set-up i pull up the rode until the warp to chain shackle is at the bow and then i tie the second anchor’s warp firmly into the shackle and then lower the chain again to the depth required. What i have on the bottom at this point is the bower anchor on 2 x boatlengths of chain and then warp but with the ‘stern’ anchor warp also tied into the shackle…..then there is just the primary warp coming up to the bow fairlead. 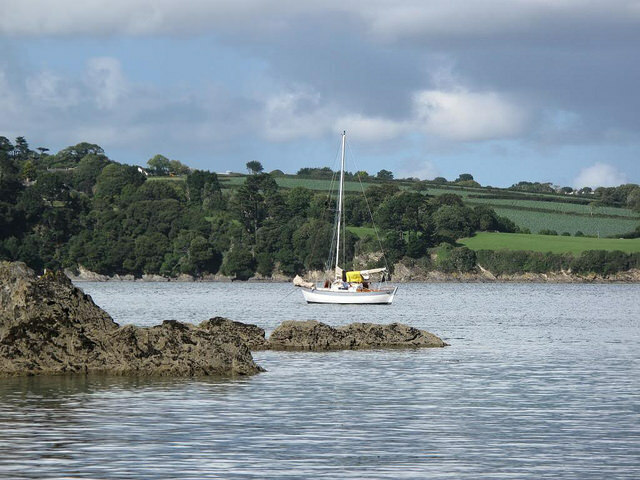 The boat only lays to the one anchor at this time but with less shearing especially in awkward wind over tide and then when the tide turns the boat just rotates and lies to the second anchor. Retrieving the anchors is simple : first pull up some rode and disconnect the second anchor, ease out warp and pull back to over the second anchor and retieve that first and then pull up to the primary anchor as normal. For sure the second anchor and warp does tend to get muddy as the whole thing tends to lie in the bottom but thats hardly a huge problem. Next The boat,the voyage and the skipper.